This guide provides basic examples and details to assist in backing up the Print Manager Plus database. Print Manager Plus is designed to use a MS SQL Database type. The process for backing up SQL Databases can vary depending on the version of SQL being used, and how that was setup. Your database may not be on the print server if a SQL Server within your network is being used. The Print Manager Plus product, Software Shelf International Inc, and its staff are not responsible for the proper and safe backup of your database. This document provides recommendations and guidelines to assist a qualified Technician or Database Administrator with the backup procedure. Creating a backup file is usually done using the SQL Management Studio from Microsoft. If you do not own this studio, Microsoft provides a free version called the SQL Management Studio Express. The following demonstrates a sample process of backing up the database. If you are uncertain if this process is correct, please contact your Database Administrator or Software Shelf Support. The Management studio can be obtained free of charge from http://www.microsoft.com/downloads. Ensure the SQL Management Studio is installed on the server hosting the Print Manager Plus database. If not download and install it. a: Open the Print Manager Plus on one of your Print Servers. Within the program, go to the Print Manager icon in the upper left menu and choose Database Configuration. b: Within Database Configuration, note the entire string listed in the Database Server box. This will either be a Server Name such as. Examples: DBSERVER or (LOCAL). In many cases where a specific SQL instance is used, it will be a server name + an Instance Name. Your SQL Management Studio will typically be in your start menu under Microsoft SQL Server 200X depending on which version is installed. Upon opening the studio, it will ask for a Server name. Within this box is where you will want to type, or paste in your Instance name determined from step 1. Once entered, click Connect. By default we recommend using Windows Authentication. This requires the user running the management studio to be an Administrator of that server or have been otherwise granted database permissions. Now that you have connected to that SQL instance, you will want to browse the Databases folder and find the database named PrintManager90. Next, right click the PrintManager database and open Tasks> Backup. This will open a new dialog with backup options. Within the dialog will be a variety of backup settings. Typically everything can be left as it is defaulted, and you can click OK. Once OK is clicked it will create the backup; this may take several minutes. Below is a reference of some of the basic options. As an alternative to backing up MS SQL/MSDE databases using the SQL Management Studio, one can also backup the files manually. The Print Manager Plus database by default consists of a PrintManager.mdf and PrintManager_Log.LDF file. Advanced SQL configurations may have other or additional files, if you believe you may have this, please consult your Database Administrator. Go to the server that is hosting the Print Manager Plus database and perform the following steps. First you will want to verify which server is hosting your database. In many cases this is the same server as the Print Manager Plus. a. Within the program, go to the Print Manager icon in the upper left menu and choose Database Configuration. b. Within Database Configuration note the server name in the Database Server text box. If there is a backslash, then the server will be the portion before the backslash. In the below example, the server hosting the database is named PrintServer. *Please note that server named "(Local)" means that the SQL database is hosted locally on that server. Within Administrative Tools> Services you will want to locate the service named Print Manager Plus and stop it. Next you will need to the stop the SQL Service hosting your database. 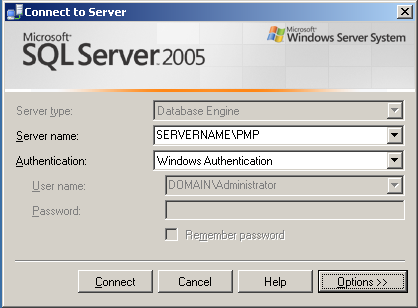 The name of the service running the SQL Service may vary, but most installs of Print Manager Plus SQL Server (PMP). Below are some typical names to check. If you are having difficulty determining the SQL Service running your database, please consult your Database Administrator. The following is a sample of PrintManager database files being selected. Once the files have been located, it is recommended to COPY them to another safe directory for backup. Off server backups are always recommended incase of total server failure. Next you will need to start the SQL Service that you had stopped in step 2. Once the SQL Service is backup and running, you will want to start the Print Manager Plus service. Other print servers running Print Manager Plus and the Workstation Connected Printer Agents may be adversely effected by bringing the Database Offline and Online for backup. It is recommended that all other servers running the Print Manager Plus Service or Workstation Agent have their Print Manager Plus service restarted, or that the machine itself is restarted. How to Reset/Clear all Print Manager Plus database records. What Permission levels are needed for Installation and Operation of Print Manager Plus.